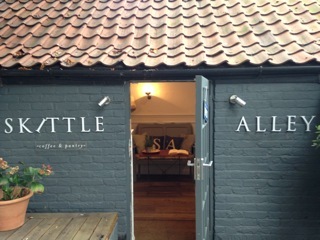 Skittle Alley Coffee & Pantry is situated in the old Skittle Alley of The Black Lion Pub, in South Black Lion Lane, adjacent to the river in Hammersmith. Two local residents opened the space last October in order to provide a community hub, coffee shop, pantry and, on Saturday mornings, a small farmers’ market. 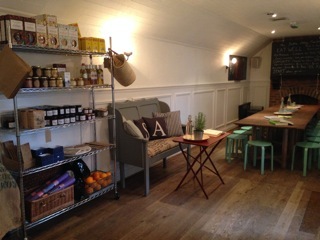 The alley is open every weekday morning from 8.30am-12noon and on Saturdays from 9am – 1pm. They serve freshly roasted coffee from Ozone Coffee Roasters in Shoreditch, bread and cakes from Sally Clarke Bakery and have an array of carefully chosen pantry goods, many made by local friends and neighbours. The Slow Food movement have recently endorsed the Saturday food market and the cafe has been awarded “Happy Cafe” status for providing an engaging and stimulating centre for the community. Dr Johnson once said that there is “nothing which has yet been contrived by man, by which so much happiness is produced as by a good tavern or inn”. I visited the Andover Arms, in the heart of Brackenbury village, so see how it measures up to the aphorism. I was not disappointed. Indeed, although the pub was probably built well after his time, the ambience, with its bare, stained boards, and the intricate woodwork of the bar, it would be easy to imagine the good doctor sipping a pint of sound ale in a cosy corner. Only the absence of tobacco smoke, and a low, but to my ears rather jarring, thrum of background music would have been unfamiliar to him. For the Andover is, first of all, a good, traditional pub, enthusiastically patronised by the locals, and open every day including for lunch. That is not to say that the bar itself is without sophistication – as well as a choice of several Fullers’ beers, it boasts a range of 15 different single malts, as well as other Scotches, and whiskeys. However, I had come primarily to sample the provender. If your taste turns to nouvelle cuisine portions, stop reading now. The menu is as traditional as the décor, though not unimaginative, and as substantial. My dining companion and I both started with the “pan” fried scallops (how can scallops be fried other than in a pan? ), crispy squid, pea puree and balsamic. It was beautifully presented: really warm, rather than lukewarm (contrary to how such dishes are too often served), firm, and succulent. My companion accompanied hers with a glass of the House champagne which was full-flavoured, and served at the proper temperature. For the main course, I chose slow roast half shoulder of lamb in rosemary gravy. My initial reaction was that it would readily have fed a family of four, and still left enough to take home for the dog. However, the meat, whilst firm, was tender, and slipped equally easily off the bone and down the throat. I noted that three vegetables were served with it, as well as the potatoes. My companion opted for the 250g (8.8 ounces in Church of England) rib-eye – the smallest on offer, the alternative being a massive 350 g (12.3 ounces). She asked for it medium rare, and that is just how it came, with a spicy sauce on the side. Talking of spicy, we ordered with it the Argentinian Malbec – good tannins and after-taste. I finished with apple and berry crumble and custard. My companion found the crumble topping slightly hard for her taste, but it suited me very well. It was filled with chunks of identifiable fruit and gave the overall impression of being authentically home-made. However, only the need for courtesy to the service, and childhood memories of being told to remember the starving, enabled me to finish the entire industrial-sized quantity. My companion was delighted with her delicately flavoured gingerbread cheesecake with honeycomb ice cream. Our choices were typical of the menu of a whole – a good selection is available, including pheasant, fish and chips, and mushroom wellington for the mains. There is also a reasonably large selection of wines, though I considered their prices to be somewhat on the high side: the excellent Lebanese wine, Chateau Musar 2002 is available but, at £60 a bottle, it has a 50% or 70% mark-up on the retail cost (depending on how carefully you buy) and the Borolo was £65. However, our Malbec was a more reasonable £26, and good enough to suggest that the establishment has refused to sacrifice quality to cost anywhere on the list. It was pleasing to see a bottle of table water automatically provided. Bread is an extra £2.25, but comes with oil. The total cost of our meal for two came to somewhat over £100, including service. I calculated that three courses, without wine or bread, would cost between £23.20 and £46.95 per person. Finally, the service was attentive and friendly. Full marks, in particular, to the manageress, who has the rare knack of charm without intrusiveness, and an obviously boundless enthusiasm for the her task. This is an establishment I should not hesitate to recommend, and to which I shall certainly return (having taken the precaution of having fasted for the week beforehand!). 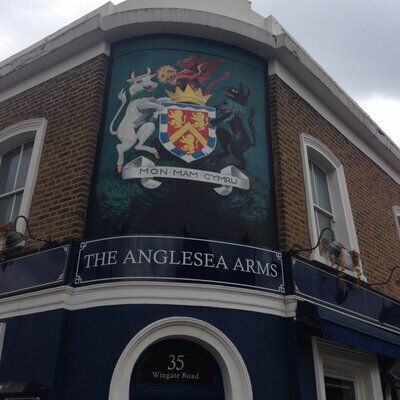 Hammersmith residents will be delighted that the Anglesea Arms has re-opened and is back to form. Little has changed in atmosphere, which is still cosily informal, and it remains possible to book. The menu continues its gastro-pub tradition. I started with moules mariniere served properly hot with a creamy sauce and plenty of onion. A surprising number of the moules were unopened, but that was probably not the restaurant’s fault. If I were being picky, the moules were possibly a fraction over-done, but restaurants have to err on the side of caution on health and safety, and they were plentiful and fresh. Bread was provided free (though had to be requested) and a finger bowl was provided automatically. I followed with a really excellent stuffed pig’s trotter, crispy on the outside and properly sticky piggy in the middle, if you like that sort of thing (which I do). I finished with an intriguing cheese selection which included waterloo, driftwood and ossau-iraty served with a very good chutney. My guests were also happy with their choices – chargrilled rib-eye steak, duck breast, and grey mullet for the mains, though a slight niggle was that the mullet arrived innocent of the advertised broad beans. Wines: the list was reasonably extensive. The Fleurie, at £30 a bottle was exactly what you would expect for that variety and cost; a New Zealand pinot noir was surprisingly complex and very drinkable. We had what could have been an excellent small bottle of 10 year old tawny port. However, the explanation that “some customers like it that way” did not really excuse its being served chilled from the fridge: I speculate that the management was confusing it with white port. Service was attentive, chatty, and (apart from the chilled port) knowledgeable; and well able to cope with the rather inconoclastic humour of my party. There were far fewer covers when we attended (a Saturday evening) than in previous glory days; but that is doubtless a consequence of the troubles the restaurant had before closure, and the regulars will soon return. A three course meal for two with one bottle of wine will set you back about £80, depending on choices. We thought it was good value and are glad to have the old favourite up and running again, conveniently at the end of our road.